Lukewarm reactions - fail to tell the whole story. That's been true with the stock market's response to everything, ranging from politics, scandals, the Summit, the AT&T / Time Warner merger, or even Fed monetary policies. 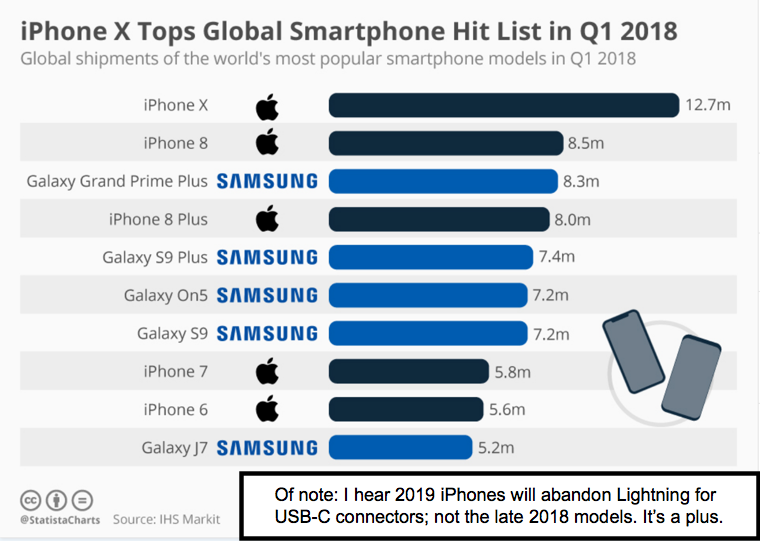 I might add none of it has been surprising (other than meek markets once in awhile to serious news); while the players overlook a lot of basic issues; at the same time they fail to see strategic shifts likely to move markets. 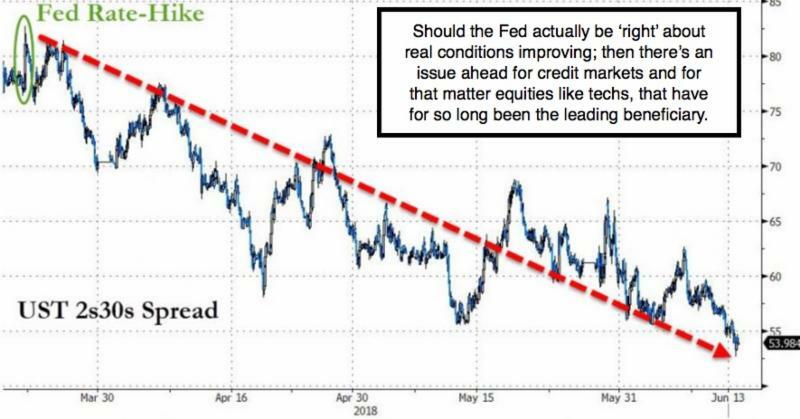 Hence, don't be lulled into any new false sense of security; just because Quantitative analysts and others tell you the market has nothing to hold it back for the many months ahead. Technicians are running around pointing to charts saying 'stocks are down to support and ready to spring forward'. That's marketing, not market analysis, at these extended levels. For sure; some stocks yes; but as many of the priciest are simply showing patterns of declining tops; and now lateral short-term lows, I'd beware lots more. Odds might favor not so strong a rebound as traders suggest, but rather a 'cratering' through those high-level supports on those issues. Now the broader stock market has a 'cushion' as we've discussed (above the 50-Day and 200-Day Moving Averages for the S&P or so on) for now; but that doesn't mean the Street's urging investors to move into already overpriced stocks makes any sense. The slippage is palpable. And what's incredible naive insanity among some firms downgrading AT&T today has a smell of insincerity. How could they not understand how arbitrage works in a merger like this? Only fools moan about a 'year of dividends' out the window (we've warned since 40 it was likely headed lower); and now that Goldman suggests selling 'T' to buy 'NFLX'; I'm more convinced that's just the wrong approach. In fact I'd do exactly the opposite for the long-term. Really a time of greater roiling and uncertainty should appear in markets; a bit at a time due to the structure we've got (passive investing) and also the fairly comfortable 'cushion' above key support levels for the S&P. During a time like this, limited new purchases should be contemplated; perhaps the likes of an AT&T (such as this past session or ahead as it craters a bit due solely to 'arbitrage' relative to the Time Warner merger approval), or even a little stock like LightPath Technologies, which may not do much day-to-day, but has shown how thin it is with an ability to sprint when buying-in-size shows up. The only urgency for those nibbling at LPTH was a couple weeks ago as it flirted with the 2 (even) level; or T twice today as it pressed 32 again. 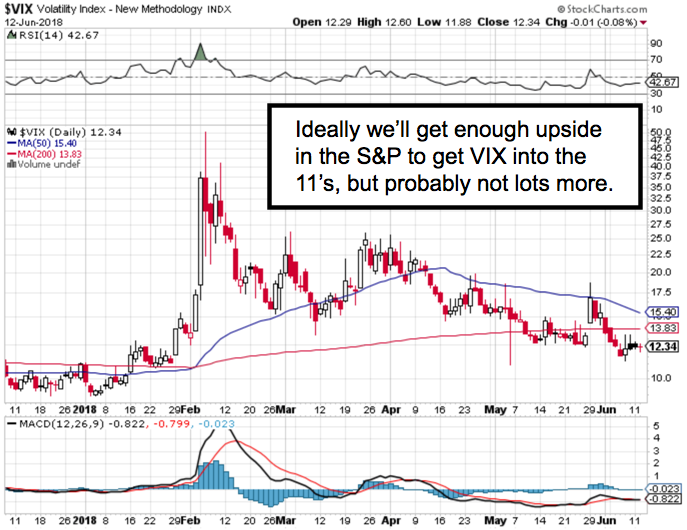 Sure T might drop into the high 20's; and moaners can cry; but we were right as regards the impact of leverage, and while it can take a couple days more, or longer, to settle-down a bit; let's see if this proves to be important. Only risk out there might be the overall market collapsing; which of course will impact all the huge companies. But less so those with dividends and not a high multiple (like an AT&T), or so cheap that they're not a source of funds (like a LightPath). The latter made a base technically and might be getting ready to pop a bit (chart suggests it); while the former has to build a base. Of course those that also migrate to (I discussed it before) DirecTV NOWwill find all that is data-free and also is quite attractively priced (on a base package down to $20/month after the first 3 months if one prepays it for the free Apple TV 4k). My point is that's prioritizing and Netflix or Sling orHulu can't really compete, especially if one adds HBO. In-time they'll grow the 20 hours of DVR in the Cloud (or make it unlimited) and include more sports, and well, US media distribution changes mature. Short-term that's a drain on AT&T resources as well as recovering the cost (huge) of buying DirecTV; long-term it should become heavily accretive to revenues, and even raise the P/E multiple (perhaps a lot). That's hard for some conservative investors to grasp on a day the shares drop more than their dividends for a year; but of course Executives at AT&T knew this was the 'arbitrage' outcome to start with (and who knows maybe I'm wrong, but I'm probably right); so they must believe it's a plus for the longer haul and incidentally highly competitive. As to Trump and the 'higher costs' burden on consumers? Doubt it. Actually (especially if you have fiber) it's just the opposite there too... except perhaps for very basic internet/TV and clearly it all means more to those with fiber and is part of why the rapid build-out of fiber by Google, AT&T, Comcast and Charter. The new race is on as it really does need fast internet for all this to work well; and sets-a-stage for 5G to deliver similar outcomes for wireless-broadband/advanced cellular. If they do cut the dividend temporarily and/or a market break occurs; that's an even better opportunity to enter; with really minimal long-term risk. Yes I think traditional shareholder ownership structure likely is so conservative; dividend-only oriented; and really don't see how transformative AT&T is as I've discussed, and that was even if they didn't get TWX. They got it so the arbitrage purge pulls the unknowing into selling instead of buying more, or generates a few downgrades, when they should be issuing upgrades. 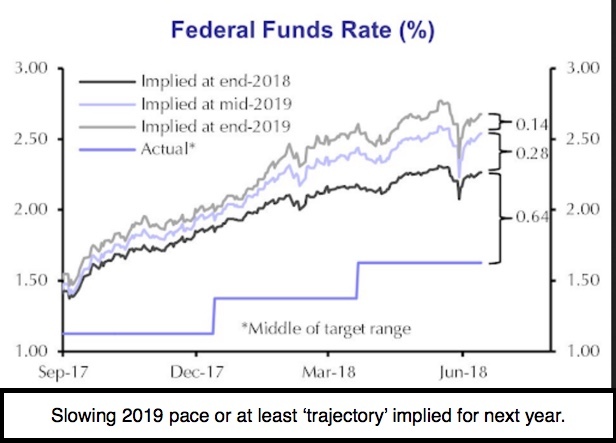 As to the Fed, the charts tell the story; there's no news there other than as Chairman Powell noted; there's likely a series of additional hikes coming. I think a lot of Bulls are unhappy about that and forgot the credit markets as a challenge; hence you got the secondary decline after the first sell-off led to a rebound in the S&P; before the late post-news-conference slide. 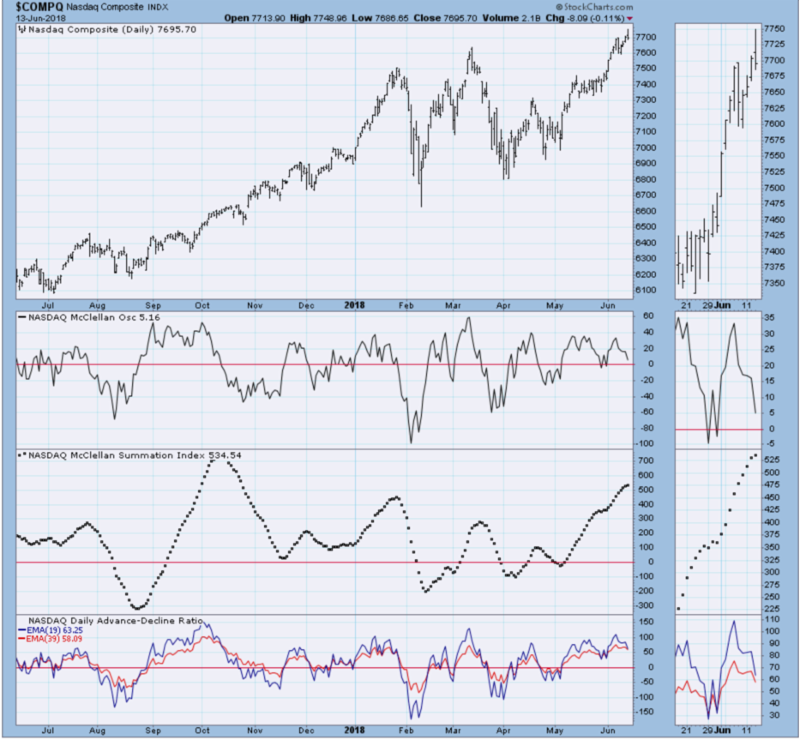 Bottom-line: I am not being cynical about suggesting limited S&P upside; if any from here. Sure they will try rebounding; but the general tone is not at all so glowing as some pundits have portrayed it. Yes there's still a fight ahead; but again it's irrelevant if the S&P hits 3000 (which I actually doubt) or if it nudges higher. 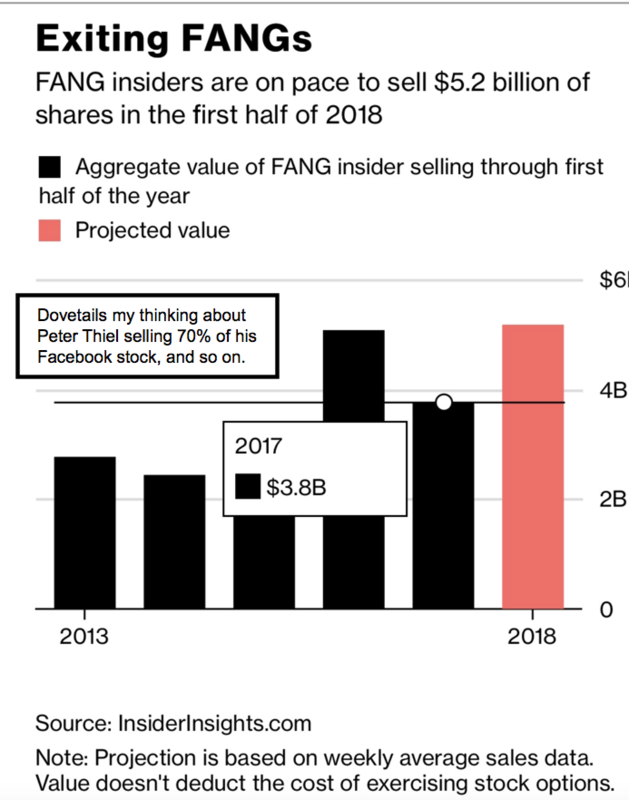 It's been an ongoing distribution as I've contended all year on the rallies; starting with the parabolic January thrust and including a suspicious that Peter Thiel's (PayPal co-founder) sale of 70% of his long held Facebook shares were just a revealed symptom of what others were doing too; but perhaps more closeted in their off-loading. See comments below about Buffett's liquidity raise. Caveat emptor. Daily action - reminds everyone first of the bumping-up against resistance that in my opinion is more concerning that those calling for 'supports' now being approached to hold, for many of the pricey FANG (etc.) type stocks. 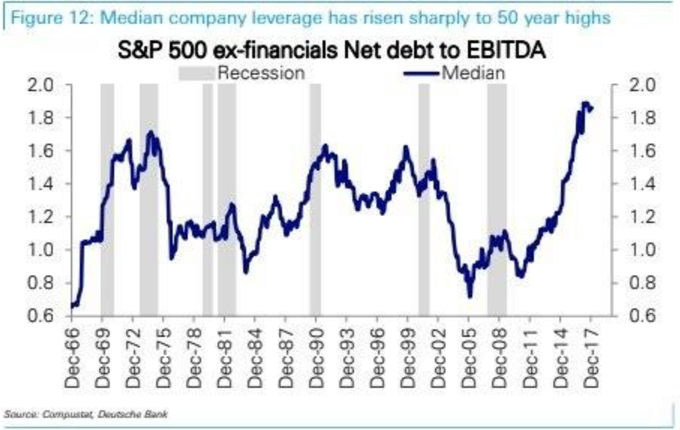 Also remember we're in the most leveraged times of recent history for lots of companies; and most of the market's recent extension was based on an injection of leverage (and lack of competitive credit market attraction) more so than fresh capital flowing in. To be specific, this become more tenuous, in-part because corporations to a large degree have swapped equity for debt by doing stock buybacks. It's not presented that way, but largely and indirectly allowed greater executive compensation, as insiders subsequently used resulting rallies to sell into it appears. I've suspected that all year; and evidence now supports that. Incidentally, although he's almost always early; did you believe the pitch to buy coming from the affable Warren Buffet ? I don't disagree in the sense of assessing a company 'as if you're running it for the next 50 years'; and I think deals like AT&T just did set them up to be prominent for years ahead (as an example). However, how prominently has the financial media made it known today, that Warren Buffett was holding $116 billion in cash at the end of 2017, representing an approximate cash position of 25%. For such a long term 'only hold' investor; that's a lot of cash; and sounds like more or less the guidance I've provided (hold core positions but less high-cost portions and scale-out a bit into strength). 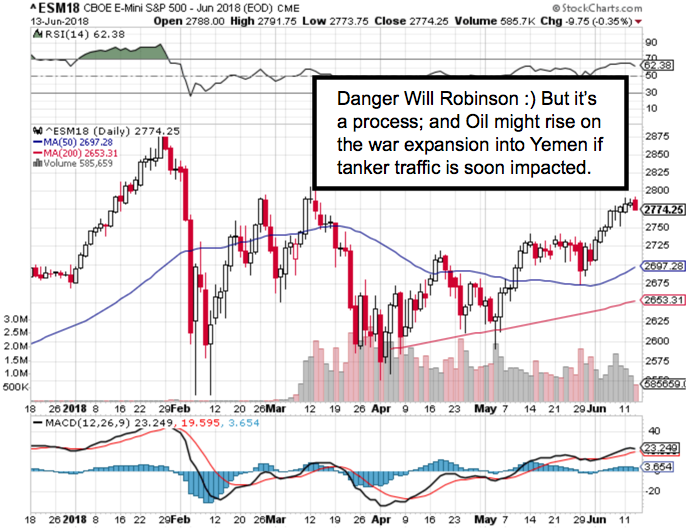 Conclusion: the 'tipping point' for the S&P was as nailed in late January. 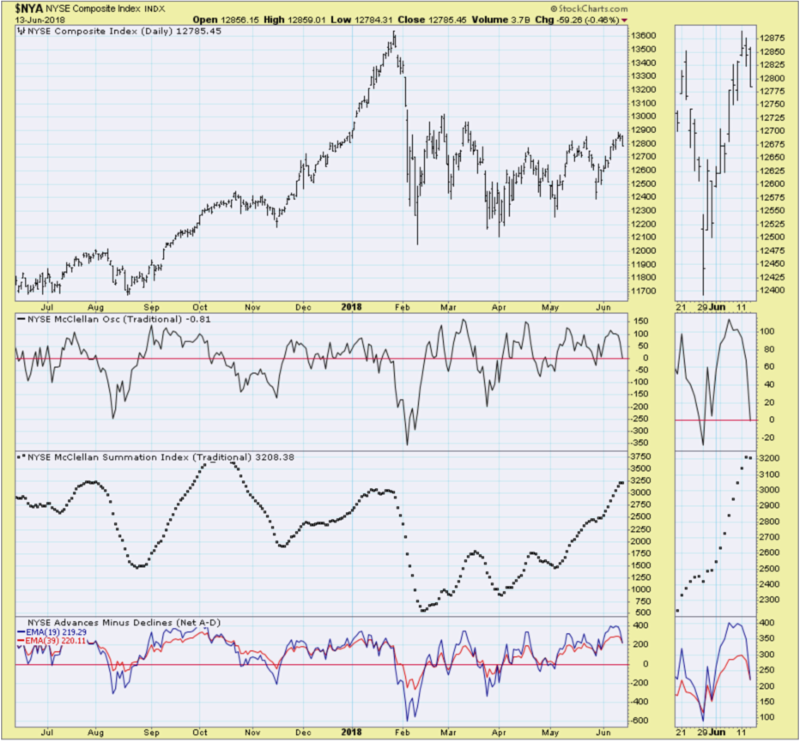 It is more probable that the recent rally in the Index is essentially 'testing' the highs (a technical secondary test and also in overbought conditions). If so it is anything-but the start of any magnificent 'mania' to the upside. Thursday might be something like down-up-down; but we'll see. Generally it's a continuing slug-fest with a realization some have likely missed today. 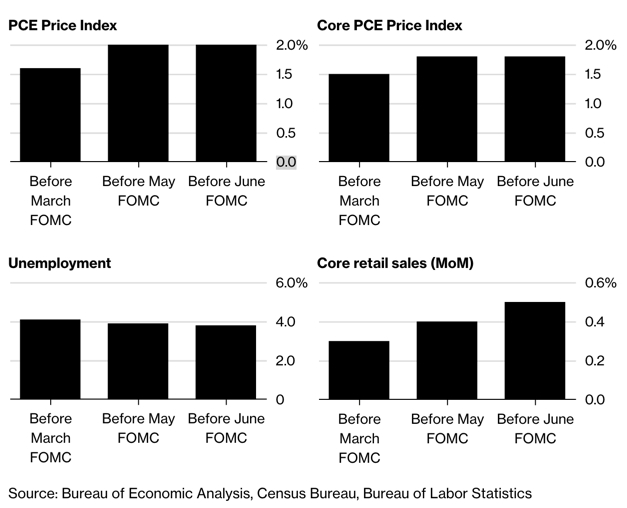 The May FOMC Minutes flagged 'any further' rate hike as small 'technical adjustments' to implement monetary policy. That's not how it sounded just today; and Chairman Powell was pretty candid and coy by saying it was to reflect 'balance' in the economy; not create cushion so he can lower rates, should there be a recession. Of course he could never admit that; as just saying so would suggest they are ramping rates at too fast a pace. The Status Quo Is Over - or so it seems; whether in geopolitics (with by the way an indirect message conveyed to Iran by virtual of the historic and much debated Singapore deal with North Korea), or in the Trade realm. 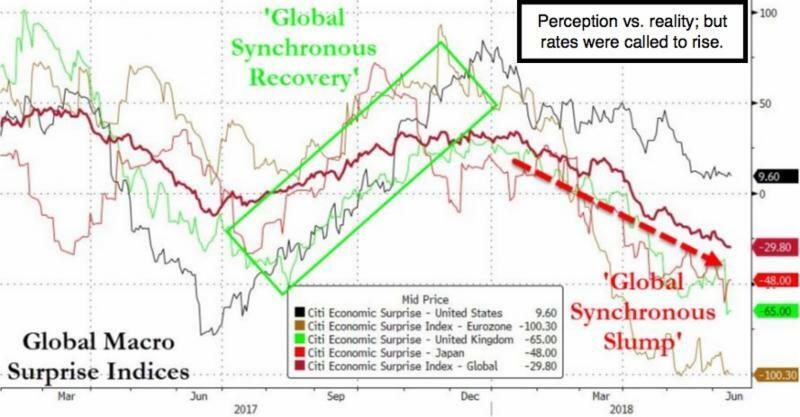 A multiplicity of issues confronting the world just now have barely moved the markets; which has been shuffling around amidst the preamble to the Summit; the fallout from Quebec's G7 gathering; and shouting matches so beyond-the-pale, that I suspect might have contributed to Larry Kudlow's heart attack. Last night I said 'shame' on Peter Navarro for the terminology he used in-reference to Canadian Prime Minister Trudeau (even Trump in this case was respectful by comparison); and at least he apologized for that today. Knowing Larry Kudlow has worked on both sides of the aisle and on Wall Street, with an internationalist tone by the way, I suspected his stress may have been pushed over the edge by Navarrow who is more isolationist in the opinion of many; and certainly less polished in his phraseology. Now that everyone tries to ascertain where 'Kim Jung Un's head' really is, we can move on to the Fed Meeting or maybe reconciliation with Canada. A lot of political capital was spent both unwinding our trading relationships (in hopes they actually don't unwind); and on motivating North Korea quite frankly to realize they had a choice of 'peace or war', not more intimidation such as they practiced (and bamboozled) through many Administrations of both political parties for decades. Trump got him in a room (or the reverse if you believe it was more setting a 'floor' that sustains the Kim dynasty.. with his sister in the wings..) with a legitimacy they never had before). I don't believe President Trump has an ulterior motive with North Korea; and really view his reference within a key speech in Singapore to introducing 'commerce' as part of the solution. The naysayers will point to Trump's iPad displaying condos and hotels that could be built on beaches in the North; and why not. Just to survive, North Korea has gradually allowed some 'commerce', but nothing like China's as they stick closely to failed Stalinist-era economic designs. Trump knows of course real estate, and Kim did walk through a hotel-CASINO on his very surprising (to the gamblers and guests) walking tour the night before. So I don't find it odd at all that Kim would see the virtues of 'commerce' as the solution to a lot of problems. Making jokes about building a 'Trump Tower' in Pyongyang is cute; but the reality is that's just fine and the Trump group should not be criticized if (years from now) one actually materializes. Shorter-term a lot more has to materialize, starting with a schedule for the efforts to denuclearize the Korean Peninsula, with many variables. Sure, Trump is quite the character, and he might be played by Kim here, but we really are finally doing 'something' and whether it's financial reform, peace in Asia, and coming efforts to fix the Iranian mess; it's more than what has transpired in the past. Again, a business-like approach too many disdain. Bottom-line: the Summit was a superficial success; with the outcome still a long process that we'll monitor of course. However it is as we suspected (just from North Korean TV covering it 'live', which is unprecedented, you just knew it would be hailed as successful), and can now 'sort of' move off the front-burner as far the stock market is concerned (barring surprises). On Canada, while too many are apologists, and the language was foul; it's true that our allies have become too accustomed to putting tariffs on some of our products, while comparable exports of theirs aren't taxed. This has to change, and continues being worked-on. Navarro might not be the guy to handle relations with anyone after his display on the weekend however. And meanwhile Larry Kudlow thankfully is recovering; hopefully fully. 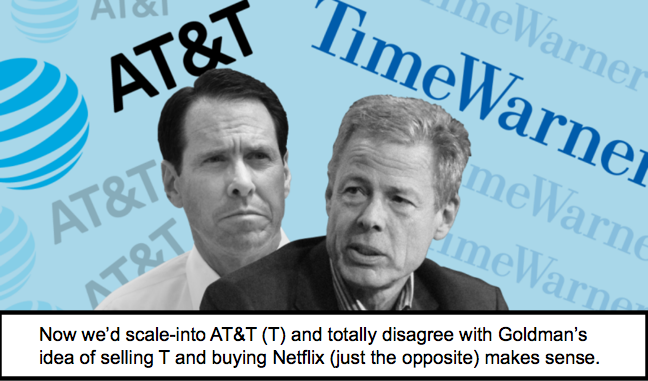 The Antitrust guys aren't recovering; so lets hope they don't try to 'stay' the long contested, and now-approved (unconditionally at that) huge merger of AT&T (T) with Time Warner (TWX). If not blocked it will close by the 20th. I need not remind members that I avoided new purchases of AT&T near 40 and in the very low 30's had singled-out AT&T (T) in several comments as a decent (relatively safe compared to others) investment. I mentioned it at the Las Vegas Money show and video interview there as well. Yes it's a couple points higher; but as the 'arb' boys lean on it, it's again attractive. My point was primarily related to the low multiple and (hopefully retained in the present competitive era of cannibalizing DirecTV satellite business) by it's sibling DirecTVNOW streaming service, in-order to capture share in the forward-looking content-distribution realm, also known as 'OTT', or internet 'over-the-top' broadcasting. The 'vertically integrated' merger with TWX will enhance their presence; and might even evolve the face of CNN one day. 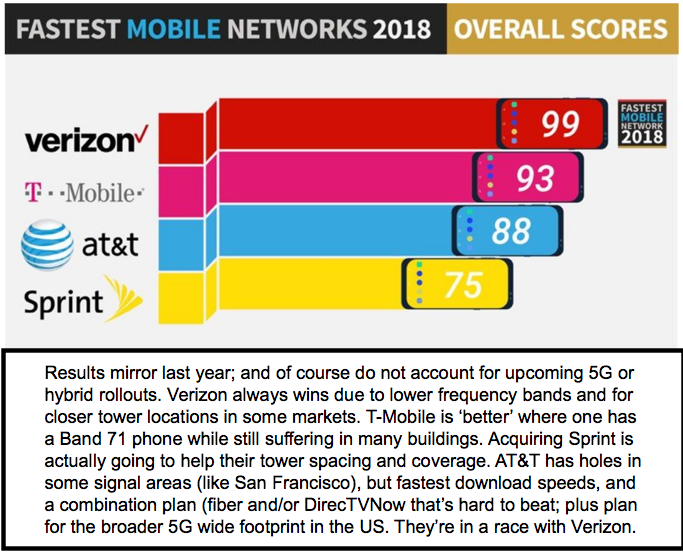 Conclusion: AT&T moved up a couple points in the wake of my favorable recent mentions; and now will retreat, due to the 'arbitrage' aspects of the deal of course (that's why it's down in after-market trade and Time Warner is up a few points). Let's see where AT&T 'settles', and new members (or a few who want to add more) might look at that possibility. My primary 'view' is the affording of a higher multiple as the combined new AT&T becomes viewed as a 'media' or more a technology company, rather than priced as a 'telecom', which would over the next few years perhaps warrant a higher multiple. I said I'd like it, merger approved or not; but for sure better with approval. 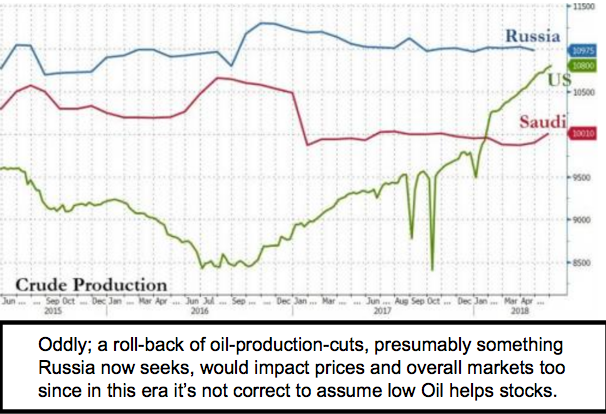 If they have to cut the dividend in the process of the evolution; so be it (I hope not). However if that happens and it shakes out, that would be another buying opportunity; but let's deal with it should it actually occur. Otherwise it's simply a hold and buy on weakness. I think it has been a good example of how I feel about some core holdings; liked it a lot back in the wake of the 'Epic Debacle' a decade ago; not at 40; and again in the high 20's or low 30's. I tend to get less enthusiastic as a stock gets more expensive; which seems to be a good discipline while holding. In-sum: S&P now awaits an FOMC rate Decision tomorrow (Wednesday). 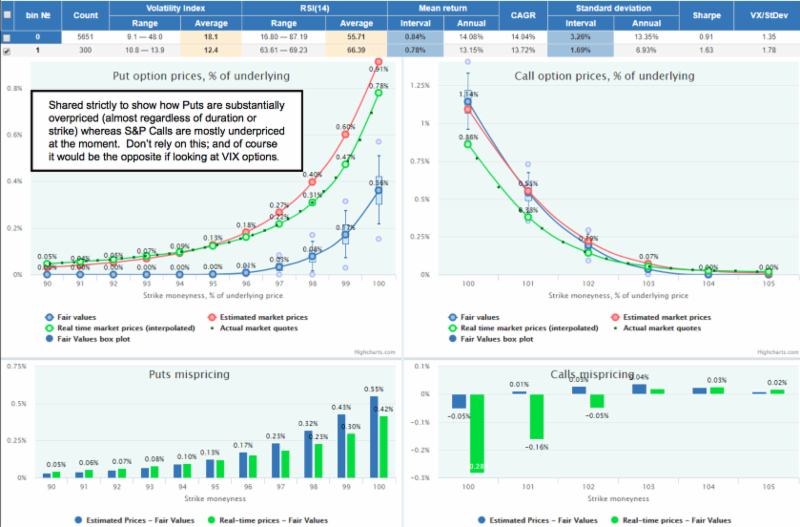 Expect a Quarter-Point rate 'hike' ideally; even if a lot of folks believe it's unjustified. Remain nimble and flexible, not getting excited about all the talk of a 'media-based' rush to incredible heights. 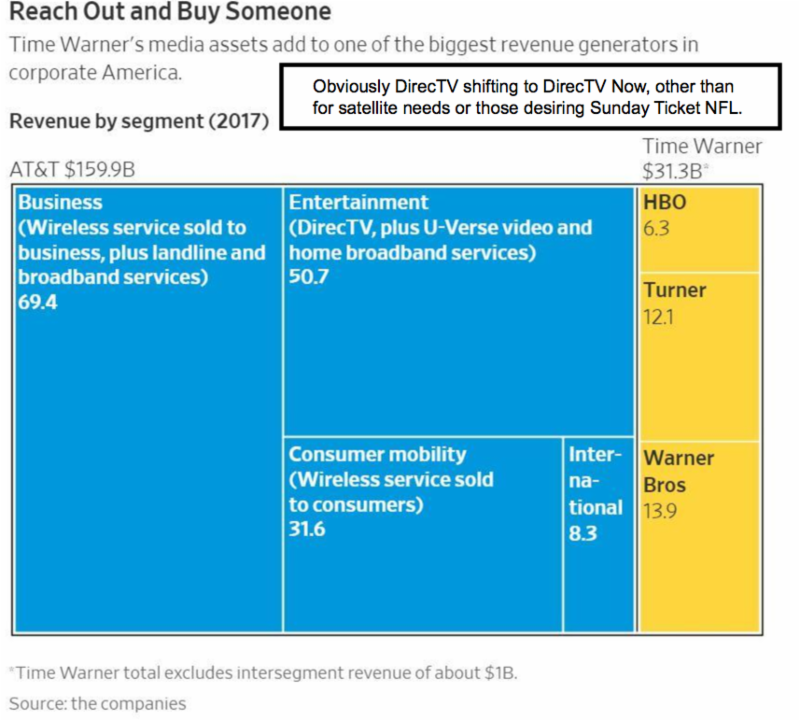 For sure you'll see more consolidations and mergers in the field (starting with Comcast / Disney / FOX efforts presumably); but that won't levitate overall broad markets too much. It does excite Wall Street, because it very simply means new 'deals' coming (hence investment banking / legal business). The one outsider for now is CBS because of the wrangling with the Redstone family, which has kept full control away from Viacom. While I don't see traditional media as a glamorous target like the old days, it still matters. And CBS 'All Access' is, in my view, a stop-gap approach trying to get more revenues than contract negotiations with OTT distributors have offered so far. Stay tuned for a potentially wild ride Wednesday but again don't assume a conclusion in the direction of the initial response to Fed action. Short-term may extend, then stabilize briefly; but stay calm and don't get too excited. No worries as it will calm down after any such effort. This is a marathon, not a sprint, as the old saying goes. Technically it's been an increasingly enduring and tenacious 'process'; so let's not be complacent about it merely carrying-on indefinitely. Current Services Offered by Inger & Co.
MarketCast membership is available at www.ingerletter.com. No username or password required: all reports are emailed directly to your inbox: $390 / Quarterly. To upgrade or downgrade an existing membership, or with questions, please email Gene directly at gene@ingerletter.com as he will be pleased to provide assistance. 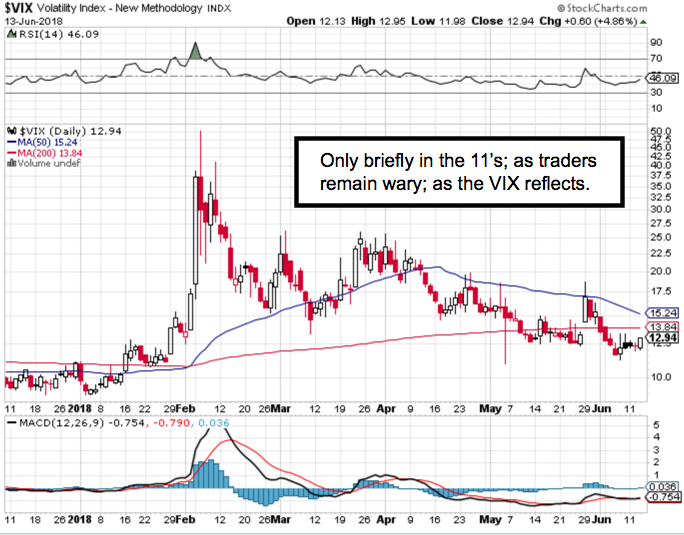 Nightly audio-video analysis of short-term and macro market conditions. Emailed by 9 p.m. ET each evening, the Daily Briefing focuses on S&P technical market prospects; plus interrelating monetary, geopolitical or psychological factors impacting action. Daily Briefing memberships are available at: www.ingerletter.com . No username or password required: reports are emailed directly to your inbox. $159 / Quarterly. Gene Inger's MarketCast™ Our intraday video service focus is on S&P E-mini futures guidelines, plus DJ, Treasuries, Oil and selected stocks. Video emailed several times daily or as noted. Please note: a MarketCast membership includes the Daily Briefing. Both services include Gene's audio/video analysis emailed nightly. Videos play via any browser or smartphone; in email 'pane' or full screen if selected. Newer email software 'may' play reports directly from email, without need to open in a browser. 'Click' for full screen. Both services are sent by email, so there is no need for user names or passwords. Services are provided at least 50 weeks annually. When traveling, Mr. Inger indeed updates members as market conditions dictate; with any revised schedule normally pre-announced. Copyright© 2018 The Inger Letter. All rights reserved.